Poverty reduction and economic growth are possible when countries invest in educating their people. Research shows a positive relationship between educational attainment and individual income, and that a highly skilled workforce can spur economic growth. Investment in human capital leads to improved worker quality, which directly reduces poverty and contributes to a reduction in income gaps. Education also yields strong economic and social benefits for girls and women. There is a strong correlation between girls’ education and accelerated economic growth, slower population growth, higher wages, increased agricultural yields and labor productivity, and improved health and well-being at the household level. MCC applies country ownership—one of its core principles—in its work with partner countries. Countries that identify education as one of their constraints to growth design projects that are consistent with country goals and strategies and work on policy and institutional reforms that will enable inclusive, quality education. Yanta (2nd from right) studies in the courtyard of College Saint Marie de Tounouma, the secondary school she attends in Bobo-Dioulasso, Burkina Faso. Yanta, a BRIGHT School graduate, was the first girl from her family to attend school. MCC is committed to gender integration and social inclusion and seeks to maximize girls’ and women’s educational, employment, and entrepreneurial opportunities by focusing on improving access to education and training, developing capacities, training teachers and community leaders, encouraging government reforms, and increasing community and private sector involvement. In September 2017, Congress passed the Reinforcing Education Accountability in Development Act (READ Act), which required 11 U.S. Government agencies to collaborate on a comprehensive United States Strategy to promote quality basic education in partner countries. MCC’s goals, mission and country-driven approach are consistent with the strategy and it is proud to be an implementing agency in the U.S. Government-wide strategy to help improve the effectiveness of education assistance. 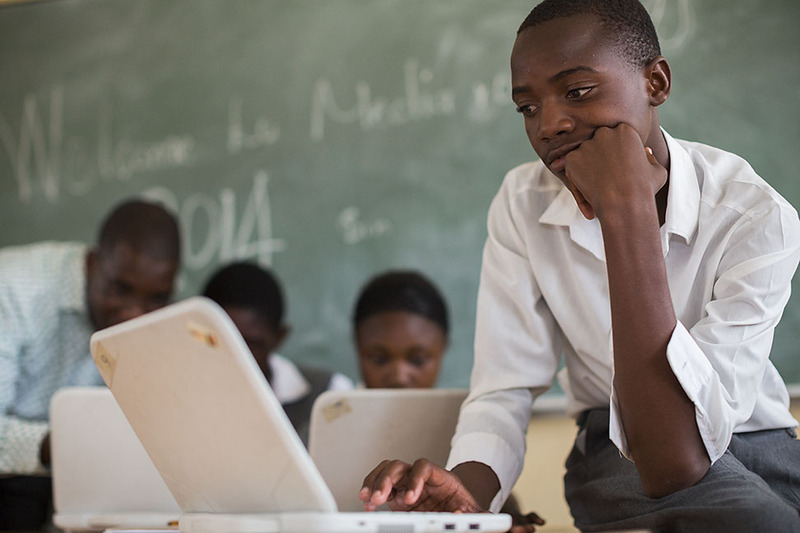 Read the MCC annex to the U.S. Government Strategy on International Basic Education. In 2013, MCC and the Government of Georgia signed a $140 million compact to improve the quality of education in the science, technology, engineering, and math (STEM) fields. A partnership between the Government of Georgia and San Diego State University is a key component to the Georgia Compact and includes three Georgian universities as local partners to deliver joint-degree and ABET-accredited science and engineering programs. SDSU is also developing measures to promote female faculty in STEM fields, where they remain underrepresented, particularly at higher levels. MCC has invested in public-private partnerships across our education portfolio, including in Mongolia, Morocco, Georgia and El Salvador. In Morocco, the Employability and Land Compact is financing a grant fund that will support the creation of public-private partnership models for technical and vocational training. The new centers will provide training driven directly by the needs of the private sector, thereby helping to close the gap between supply and demand of specific skills in Morocco’s growing economy. The ability of individuals to be productive members of society starts with the opportunities available to them during childhood and adolescence. MCC invests in primary and secondary education in to ensure that male and female students—particularly those in disadvantaged areas—obtain the foundational knowledge and skills needed to obtain jobs and contribute to their countries’ economic growth. As part of the MCC-funded renovation and expansion of Olukolo Junior Secondary School Ondangwa, Namibia, students received new classrooms, access to clean water, laboratory and computer equipment, and new textbooks. MCC’s $304.5 million compact with Namibia invested approximately $90 million to enhance the effectiveness of primary and secondary education in disadvantaged areas. In schools with overcrowded or degraded classrooms, and insufficient teaching-learning resources to succeed in English, math and science, MCC provided funding for textbooks, science laboratory equipment, laptops and school libraries; targeted teacher and administrator training to improve instructional leadership and effective use of materials; and school rehabilitation or classroom expansion. MCC also worked with the Ministry of Education to launch a continuous professional development program and implement new policies and efficient procedures for facilities and textbook management and maintenance. 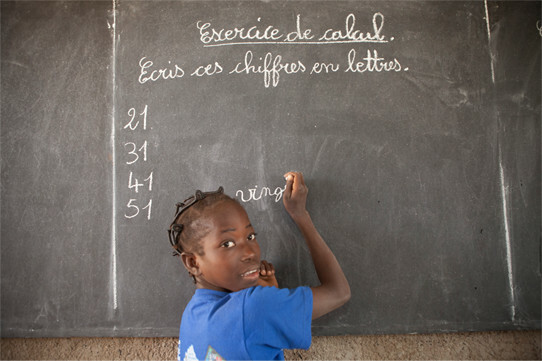 A young girl writes on a blackboard during class at Kouka Primary School, a BRIGHT School in Kouka Department, Burkina Faso. 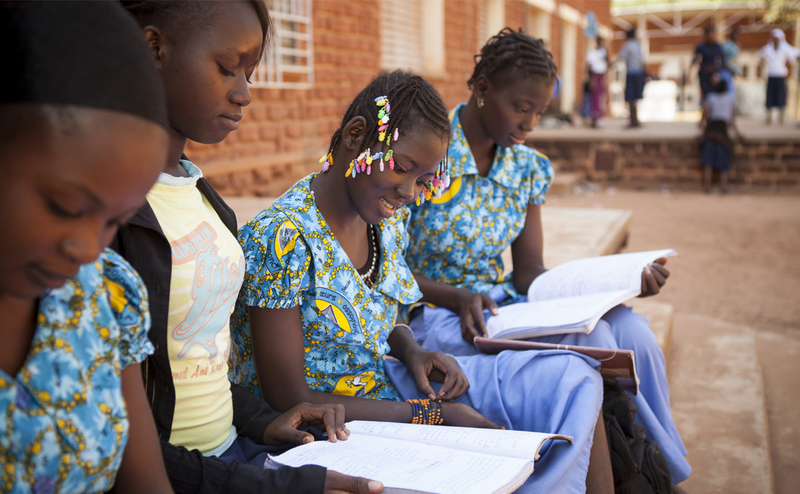 Through an MCC threshold program and subsequent $480.9 million compact in Burkina Faso, MCC invested $41.9 million to increase girls’ enrollment and primary school completion rates. These projects were implemented through a variety of school-based and community interventions aimed at reducing the burden of time-consuming household chores and preventing early marriage. Over eight years, funded construction of 396 new classrooms in 132 primary schools across the country through a program called BRIGHT. The program provided the schools with access to drinking water and separate latrines for girls and boys, mobilized community support and improved school engagement through mothers’ associations, provided take-home food rations as an incentive for girls’ enrollment, and launched adult literacy and micro-finance training for mothers. An independent evaluation conducted after the Burkina Faso BRIGHT program ended found that school enrollment was six percent higher than in non-BRIGHT communities, and even higher than that (10.3 percent) for girls specifically. Overall primary school completion rates were 13.5 percent higher in BRIGHT communities, and there was even statistically significant evidence that girls in BRIGHT communities were less likely to be married – a difference of 6.3 percent. Programs like these can have a lasting impact on the opportunities girls and boys will have as they stay in school longer and gain the skills needed to successfully join the workforce. Public school students in Gori, Georgia, await the reopening of their school following its rehabilitation. The school building was rehabilitated as part of Georgia’s second MCC compact. The compact is rehabilitating dilapidated school facilities, upgrading utilities, and providing science laboratories and equipment for Georgian public schools. MCC’s Georgia Compact II is entirely dedicated to the education sector. 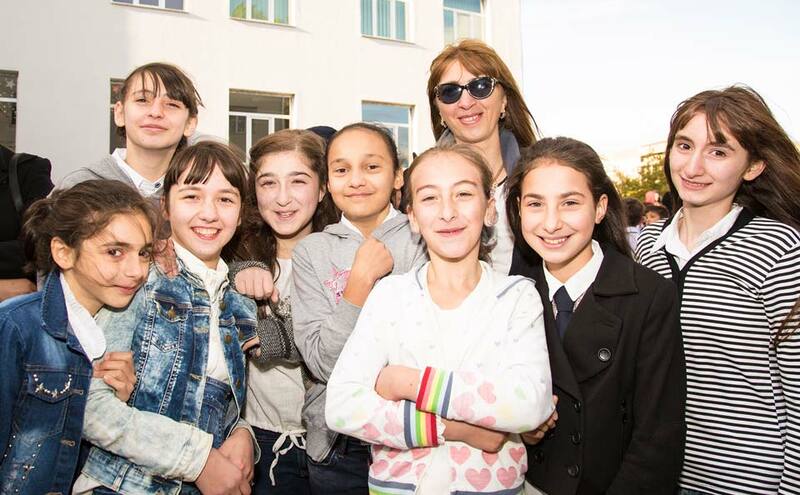 It includes a project focused on improving the learning environment in Georgian schools by rehabilitating school facilities, training teachers and principals, and supporting student assessments. This includes training teachers on specific subject matter, training principals on school and administrative management, and rehabilitating school infrastructure while developing an operations and maintenance plan to ensure investments in public schools are well maintained for years to come. MCC is also working with the Government of Georgia to improve upon and expand testing and assessment systems that will track students’ progress, both nationally and against international standards, and analyze results in order to inform policy decisions. 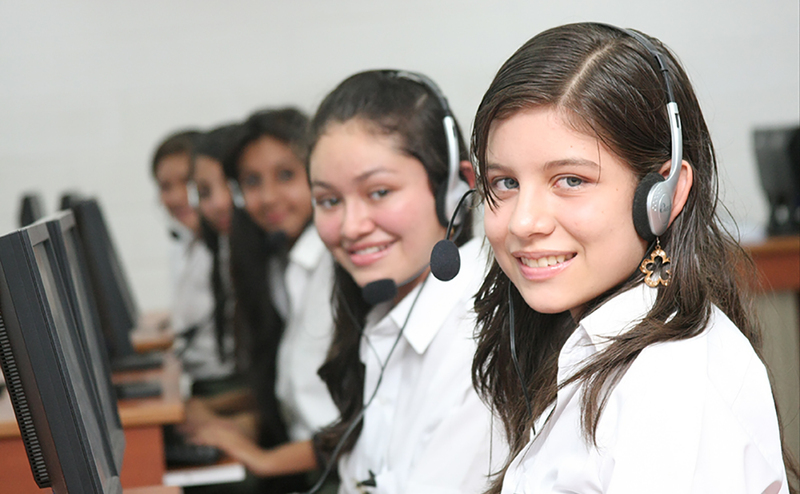 Girls learn new skills at an MCC-funded high school in El Salvador’s Northern Zone. The rehabilitation of the high schools alone is expected to benefit more than 9,700 students every year. In El Salvador, a shortage of skilled labor is a key factor that limits investment in the country’s export sector and its competitiveness in global markets. MCC invested $30 million as part of its 2006 compact with El Salvador to help students in the poorest area—the Northern Zone—to develop the necessary skills to work in the country’s growth industries by renovating 20 secondary technical schools, developing demand-driven curricula, training teachers, and providing scholarships. MCC’s $277 million El Salvador Investment Compact is focused on strengthening the national education system by reforming the laws, policies, and operations that govern teacher continuous professional development, student assessment, and information systems. Teacher training is being provided to enhance knowledge in key subject areas as well as pedagogical training in active learning methods. To help teachers apply the training, curricular learning plans and improved methods to assess student learning are being developed, as well as a system of teacher performance management. The compact is also implementing the full-time inclusive school model that extends the school day from part- to full-time; provides instruction using active learning methods in core subjects including English, math, science, and information technology; and focuses on competency development. MCC is making significant investments in infrastructure and equipment to improve the learning environment and ensure that a high school will exist in each cluster of schools, allowing greater attainment at the secondary level. In Côte d’Ivoire, MCC is supporting lower secondary education through the implementation of four activities aimed at improving access to and quality of lower secondary education, especially in underserved areas of Côte d’Ivoire with underserved populations. To do so, MCC is supporting the construction of approximately 70-80 new lower secondary schools in rural areas of Gbeke and San Pedro; the development of improved pre-service teacher training; the establishment of new teacher training facilities for enhanced pre-service and supervision and oversight of newly trained teachers; improved school governance initiatives; and, the development of a new Gender Action Unit and Gender Policy under the Ministry of National Education. The Morocco Employability and Land Compact includes a Secondary Education Activity that aims to provide Moroccan youth with the skills needed to get jobs by improving the quality and relevance of secondary education. The activity includes investments in improved school management practices, teacher training focused on student-centered learning approaches, and infrastructure renovations to improve the learning environment. MCC is also working with the Government of Morocco to improve student learning assessments and the education information management system, as well as to establish a system for the operations and maintenance of school infrastructure. MCC works with partner countries to increase access to and improve the quality of higher education for students. In Namibia, MCC expanded access to post-secondary education and improved the climate for developing skilled workers by assisting the Ministry of Education in its efforts to establish a sustainable and more widely accessible education finance system. MCC also helped launch a National Training Fund, which allows potential employers to fund education programs based on the skills needed. Young women in Georgia celebrate the partnership between San Diego State University and the Government of Georgia that brings STEM degree programs to Georgia. In Georgia, a lack of skilled professionals in the fields of science, technology, engineering, and math (STEM) had become a bottleneck to the country’s economic development. As part of the Georgia Compact II, MCC is supporting a partnership between SDSU and the Government of Georgia to allow young Georgian men and women to pursue internationally accredited degrees in STEM subjects without leaving their home country. 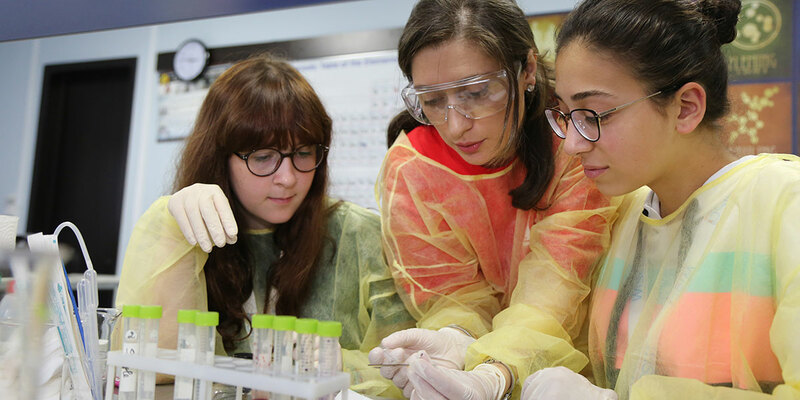 The program includes three Georgian universities as local partners—Tbilisi State University, Ilia State University and Georgian Technological University—and includes a focus on increasing women’s participation in STEM professions. In Côte d’Ivoire, to ensure the sustainability of MCC’s transport investments and increase the skills and training of Ivoirians, MCC is supporting the development of an Infrastructure Graduate Program. This Masters-level program will train students in the knowledge and skills needed for road-infrastructure asset management and to improve the performance of transport-related agencies by focusing on low cost approaches through roads maintenance. MCC invests in technical vocational education and training (TVET) programs in partner countries to ensure a better match between the skillset of the workforce and the demands of growing industries. In the El Salvador Investment Compact, MCC is funding a grant facility that supports workforce development programs and other public goods that export companies need to improve their productivity and expand their businesses. At the policy level, MCC supports an integrated TVET governance system and the creation of a continuous assessment process to match training provided by schools with the skills demanded by the private sector. This includes standards for student and teacher certification and curriculum and learning method development. It is also creating an ongoing process to diagnose labor demand and create new programs or improve existing training programs to meet the demand. Current training programs are also being assessed and improved, as is the coverage area of these programs. MCC will also invest in interventions to facilitate labor mobility and job matching. 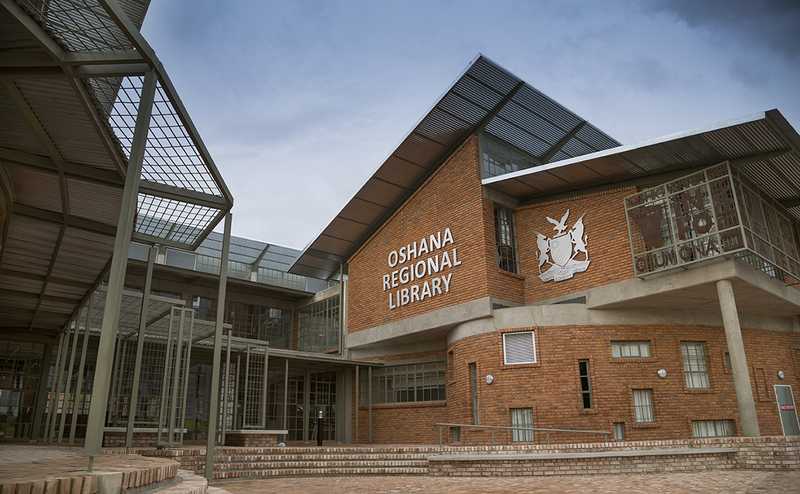 Under the Namibia Compact’s Education Project, MCC constructed many regional resource and study centers, like the Ohangwena Regional Library seen here, in underserved areas in an effort to improve access to information, resources, training materials and programs, and study facilities. In Namibia, the $304.5 million MCC compact helped move the country towards a more demand-driven and inclusive TVET system by helping the National Training Authority establish the country’s first National Training Fund, developing a grant program for training in high priority trades, and launching a program that provided academic credit for job-based learning. The compact also focused on enhancing growth in the rural areas where many indigenous minority groups live by building communities’ capacity to develop eco-tourism operations that preserve and showcase the country’s abundant natural resources, and by helping the country accommodate a growing tourist industry. To generate tourism operation skills within the community and the greater industry, MCC provided grants to tourism lodge joint ventures to provide on-the-job training in needed skills and to major private tourism and hospitality industry skill providers. MCC also provided support to regional resource and study centers that provide basic information technology skills, adult literacy services and job information services for unemployed youth, adults, and the greater community. In Georgia, where industries lack workers with the right science, technology, engineering, and math skills, MCC established a program as part of the Georgia Compact II to offer grants to public and private TVET providers who partner with industries and businesses to design and offer courses in specific skill areas defined by market needs. Across Morocco, funding in the 2007 Morocco Compact allowed training institutes to expand vocational training programs that focused on providing formal training for key artisan crafts—including carpentry, ironwork, ceramics, leather, and textiles—whose products were in demand in the national, export, and tourist markets. Compact funding also supported the renovation and equipping of fifteen schools with facilities to teach students the skills needed to participate and compete in the labor market. In the Morocco Employability and Land Compact, MCC is investing further in TVET through the Charaka Fund, a large-scale, competitive grant facility that will support the construction of new TVET centers that will be governed by public-private partnerships to ensure that the centers are training youth in sectors with a growing demand for skilled workers. The Charaka Fund is also investing in the transformation and expansion of existing TVET centers toward a public-private partnership model of governance with a goal of catalyzing a shift toward more demand-driven training throughout the country. The compact is also supporting the Government of Morocco Ministry of Education to reform the laws and regulations currently governing the TVET sector to reduce red tape and expand options for private sector involvement. In Côte d’Ivoire, the compact supports a grants facility that will allow for the development of new TVET centers that use a model that brings together public and private sector partners to create new centers that are owned by the government but managed and operated by private partners and educational institutions. The centers will focus on training students in skills and knowledge that will better meet the needs of private sector employers, while providing student with a hands-on learning experience through targeted on the job training so they are more able to be employed and retained on the job upon completion. One center will specifically focus on the public works sector that will simultaneously support the MCC investment in roads construction and maintenance, while creating a career pathway for people to advance in this field. The sector or skills targeted for the additional two to three centers will be determined through the granting process. All new centers will be required to develop a gender and social inclusion policy and action plan that describes key social and gender considerations, strategic approaches and expected outcomes. Fouiza (left) and Rita (right) attend an MCC-funded literacy class in Agadir, Morocco. Under the compact signed in 2007, functional literacy courses have benefitted thousands of adults across the country. MCC funds non-formal education and literacy programs for those who have been educationally disadvantaged and are seeking skills for self-employment or to enable them to bridge back into the education system. As part of Morocco’s 2007 MCC compact, MCC helped stimulate economic growth in the tourism sector by providing literacy training to 69,000 men and women farmers, artisans and fishers and helped to strengthen the national system for literacy and vocational education. More than 70 percent of training participants were women. MCC also funded the development or Arabic translation of textbooks and other teaching resource materials, teacher training, equipment, and capacity building for vocational school management. In El Salvador,1 a portion of the country’s 2006 MCC compact supported non-formal vocational training classes to provide educationally disadvantaged Salvadorans with the skills to get jobs or to start their own small businesses. Funding for adult literacy programming as a complement to school improvement or community-based economic development has also been provided through the Niger Threshold Program, the 2009 Burkina Faso Compact, the Burkina Faso Threshold Program, the Niger Compact and the Malawi Compact. For a country to be selected as eligible for an MCC assistance program, it must demonstrate a commitment to just and democratic governance, investments in its people and economic freedom as measured by different policy indicators. MCC’s selection criteria include a category called “Investing in People,” which measures investments in people by assessing the extent to which governments are committed to investing in primary education, girls’ primary education completion, and girls’ secondary education enrollment.